For the 3rd time in the last 10 baseball seasons, the team celebrating a World Series title is the Boston Red Sox, who defeated the St. Louis Cardinals in 6 games to win their 8th championship. This title was historic, since it was the first one clinched at Fenway Park in Boston since 1918 (their titles in 2004 and 2007 were both clinched on their opponent’s field). This was an odd series that included a lot of big hits, some big calls, and one Big Papi. This was the 4th World Series meeting between the Red Sox and Cardinals, after the Cardinals won in 1946 and 1967, and the Red Sox won in 2004. Let’s look at each game of this World Series. Game 1: Red Sox 8, Cardinals 1. The Red Sox wasted no time making a statement in Game 1. In the top of the 1st, with the bases loaded, Mike Napoli hit a 3-run double to make the score 3-0. That occurred in the at-bat after a controversial sequence that included a Pete Kozma error, first incorrectly called as an out, before a conference of the umpires led to an overturned call. In the 2nd, Dustin Pedroia singled, making it 4-0. David Ortiz hit a fly ball to deep right, and Carlos Beltran made a tough catch to save a grand slam, but David Ross scored on the sacrifice, making the score 5-0 Boston. Adam Wainwright settled down after that, but the damage was done. David Ortiz added a 2-run homer in the 7th to make the score 7-0, and in the 8th, 21-year-old Xander Bogaerts added a run on a sacrifice fly that scored Daniel Nava, making the score 8-0. Jon Lester threw 7 2/3 scoreless innings for the Red Sox, and the Cardinals scored their only run on a Matt Holliday solo homer off Ryan Dempster in the top of the 9th, once the game was practically out of reach. The Red Sox had dominated Game 1, and had a 1-0 lead (this was their 9th consecutive win in World Series play, tied for 4th all-time). Game 2: Cardinals 4, Red Sox 2. Game 2 featured a pitcher’s duel between John Lackey and Michael Wacha, and the game was scoreless through the first 3 innings. The first run of the game scored on an RBI groundout, as Yadier Molina’s grounder to 2nd scored Matt Holliday, giving the Cardinals their first lead of the series. When Michael Wacha threw a scoreless 4th, he became just the 4th pitcher in MLB history to allow 1 run or less in his first 25 postseason innings, joining Christy Mathewson (who didn’t allow a run), Babe Ruth (1 run) and Don Sutton (1 run); not bad company. Both pitchers continued to dazzle until the bottom of the 6th. In that inning, after a Dustin Pedroia 1-out walk, David Ortiz hit a Michael Wacha changeup the other way, elevating it enough to clear the Green Monster in left. The homer gave the Red Sox a 2-1 lead. The Red Sox needed a shutdown inning in the top of the 7th, but the Cardinals did not cooperate. A Matt Carpenter sacrifice fly tied the game at 2-2 when Pete Kozma scored, before a throwing error on the play allowed Jon Jay to score, giving the Cardinals a 3-2 lead. The next batter, Carlos Beltran, hit a single that scored Daniel Descalso and the Cardinals had a 4-2 lead. Carlos Martinez and Trevor Rosenthal got the final 9 outs, and the series was tied. Game 3: Cardinals 5, Red Sox 4. Game 3 will long be remembered for a certain controversial call in the 9th inning (I’ll get there in a minute), but first let’s look at what was otherwise an excellent baseball game. The Cardinals began the scoring in the bottom of the 1st, after Joe Kelly’s perfect inning in the top half, with RBI singles by Matt Holliday and Yadier Molina. Nobody got past 2nd for either side until the bottom of the 4th, when the Cardinals had the bases loaded with nobody out but failed to score. In the top of the 5th, Xander Bogaerts scored when pinch-hitter Mike Carp grounded out, making the score 2-1 Cardinals. In the top of the 6th, a Daniel Nava singled scored Shane Victorino, tying the game at 2-2. In the bottom of the 7th, a Matt Holliday RBI double scored 2, giving the Cardinals a 4-2 lead. In the top of the 8th, the Red Sox answered, with runs scoring on a Daniel Nava fielder’s choice groundout and a short single by Xander Bogaerts, tying the score at 4-4. In the top of the 9th, Red Sox manager John Farrell made a managerial mistake that may have impaired the Red Sox chances. Believing that the game may go into extra innings, he sent relief pitcher Brandon Workman to the plate, instead of opting to pinch-hit Mike Napoli, who was on the bench since there was no DH (the game was being played in a NL park, under NL rules). This was Workman’s first MLB at-bat, and he struck out. That situation was only compounded when Workman didn’t pitch an extended outing, throwing just 1/3 of an inning and being pulled after giving up a hit to Yadier Molina. Koji Uehara relieved Workman, and gave up a double to Allen Craig setting the stage for Jon Jay. Jay hit a liner to 2B Dustin Pedroia, who somehow picked it and threw it to the plate, cutting down Yadier Molina. Craig broke for 3rd late, so C Jarrod Saltalamacchia saw a potential play at 3rd. 3B Will Middlebrooks had to dive for his throw, which eventually went down the left field line. Middlebrooks ended up on the ground after the dive, and Craig inadvertently tripped over Middlebrooks’ legs/feet as he broke for the plate. LF Daniel Nava got to the ball and threw home, appearing to throw out Craig, but umpire Jim Joyce had called obstruction on Middlebrooks, which awarded Craig the next base. Since the next base happened to be home plate, the Cardinals had a run, and a 5-4 win, giving them a 2-1 series lead. Yes, the play looked awkward; it was. That’s the first time any postseason game (much less one in the World Series) has ever ended on obstruction, and the first time I’ve ever seen any game end on obstruction. In fact, I think I’ve only seen obstruction 2 or 3 times in my life. Jim Joyce took some heat from the media, something he’s unfortunately used to after he blew a call in 2010 on what would have been the final out of a perfect game by Armando Galarraga. Like that situation, he handled this one with class and dignity, or in other words, the right way. But in this case, unlike the call he so obviously missed 3 years ago, he got the call right. Whether there was intent or not (and I have no evidence that there was intent), Will Middlebrooks tripped Allen Craig, impeding his path toward home plate. I went back and timed a couple of things on that final play. First, I timed how long it took the ball to get to home from the time it got past Middlebrooks and went up the line, which was 6.5 seconds. Next, I timed how long it took Craig to get home once he got up from the trip, which is how long it would have taken him had he not tripped, and that was 4.5 seconds. In other words, if the trip had not occurred, Craig would have beat the ball to the plate by 2 whole seconds. As is, he would’ve been out by a wide margin in the event Joyce had not called obstruction. Therefore, this was absolutely te right call, as Middlebrooks inadvertent trip of Craig cost him the next base, which he was awarded. The fact that next base happened to be home plate was a big part of the reason for the ensuing controversy. This was the first World Series game to end on an error since, ironically, the Red Sox lost Game 6 in 1986 on Bill Buckner’s infamous error. Luckily for Middlebrooks he will, unlike Buckner, not be the scapegoat, since the Red Sox went on to win the series in this case. In fact, the unusual celebration at home plate by a shocked Cardinals team (Adam Wainwright claimed he thought he’d seen “the worst call of all-time” when plate umpire Dana DeMuth called Craig safe, before realizing it was the result of the events at 3rd base) was the last such celebration they would have in the series. Game 4: Red Sox 4, Cardinals 2. As bizarre as the ending to Game 3 was, Game 4 also had a strange ending, although this time, there was very little controversy. The pitching matchup was between Lance Lynn of the Cardinals and Clay Buchholz of the Red Sox, who pitched through nagging injury. In the bottom of the 3rd, Carlos Beltran singled, scoring Matt Carpenter and giving the Cardinals a 1-0 lead. Lance Lynn was perfect through 4 innings, but in the top of the 5th, after a double and 2 walks loaded the bases, a Stephen Drew sacrifice fly allowed David Ortiz to score, tying the game at 1-1. Just before the top of the 6th, David Ortiz appeared to give a motivational speech to his teammates in the dugout. Whatever he said worked; Jonny Gomes (who had been put in the lineup only 75 minutes before first pitch due to Shane Victorino’s back issues) hit a 3-run homer giving the Red Sox a 4-1 lead. This game had become a bullpen game for Boston, as Buchholz only lasted 4 innings. Felix Doubront and John Lackey were among the relievers who pitched for the Red Sox, although both had been starters in the regular season and Lackey had started Game 2, and was scheduled to start Game 6. A Matt Holliday RBI single made the score 4-2, but the Red Sox were still in control. Advance to the bottom of the 9th, when closer Koji Uehara was in to pitch for the Red Sox. Allen Craig hit a 1-out single, and was pinch-run for by Kolten Wong (Craig battled a foot injury all series, he actually had not played since September 4 before the series began). That single game Allen Craig a World Series-record 4th pinch-hit of the series. After Matt Carpenter popped out, Carlos Beltran came to the plate, but didn’t get a chance to hit; Wong was picked off by Uehara, ending the game, with the Red Sox winning 4-2, and tying the series at 2-2. Like Game 3, this was the first postseason game in history to end on a pickoff (according to STATS, only 1 game ended on a pickoff during the 2013 regular season). Game 5: Red Sox 3, Cardinals 1. Naturally, Game 5 was a big game, as the winner would be up 3-2 going back to Boston. After the finishes of Games 3 and 4, people were wondering what oddity would occur in Game 5, but the game ended up being pretty pedestrian. Game 5 was a pitching rematch of Game 1 between Jon Lester and Adam Wainwright. The Red Sox hit Wainwright first, with David Ortiz doubling in Dustin Pedroia, giving the Red Sox a 1-0 lead. After the pitchers exchanged a hand-full of scoreless half-innings, Matt Holliday tied the game at 1-1 on a solo homer in the 4th. That was the first run Jon Lester had ever given up in World Series play, ending a streak of 16 1/3 scoreless innings to start his career, the 3rd longest in history behind Christy Mathewson and Jim Lonborg. The pitchers continued to match scoreless innings until the top of the 7th. After Daniel Nava struck out to lead off, Xander Bogaerts singled. Stephen Drew came up to bat, and was behind 1-2, before taking 3 straight balls that were probably tempting to hit, and drawing a walk. Immediately I remarked to some friends in the room that the Drew at-bat may have been one of the biggest of the series. David Ross made that hypothesis possibly correct when he hit a ground-rule double down the left field line, scoring Bogaerts. After Jon Lester grounded out, Jacoby Ellsbury singled, scoring Stephen Drew, and although David Ross was thrown out at home, the Red Sox now had a 3-1 lead. Jon Lester was pulled after 7 2/3 innings, and Koji Uehara came in for the 4-out save. When he retired his 4 hitters in order, the Red Sox were going back home with a 3-2 series lead. By the way, Adam Wainwright became the first Cardinals pitcher with 10 strikeouts in a World Series game since Bob Gibson’s 5th such game in 1968, and the first with 10 strikeouts in a loss since Josh Beckett in 2003. Game 6: Red Sox 6, Cardinals 1. The Red Sox came into Game 6 with an opportunity to clinch a World Series at home for the first time since 1918. In the 1st inning, neither John Lackey of the Red Sox or Michael Wacha of the Cardinals allowed a hit. In the 2nd, both pitchers allowed two baserunners but did not allow a run. After Lackey pitched a perfect top of the 3rd, Jacoby Ellsbury led off the bottom half with a single. A Dustin Pedroia groundout advanced Ellsbury to 2nd (only after Pedroia hit a foul ball that missed being a homer by inches), and David Ortiz was walked intentionally. After Mike Napoli struck out, Jonny Gomes was hit by a pitch, loading the bases for Shane Victorino. In Victorino’s last at-bat with the bases loaded, he had hit a grand slam in Game 6 of the ALCS. This time, he missed a homer by a few feet, but hit it off the Green Monster for a 3-RBI double, giving the Red Sox a 3-0 lead. In the 4th, after a Stephen Drew solo homer made it 4-0, Mike Napoli and Shane Victorino both added RBI singles, scoring 2 more and making the score 6-0. Victorino’s hit came, once again, with the bases loaded, joining Billy Rogell in 1934 and Bobby Richardson in 1960 as the only players with 2 bases-loaded hits in a World Series game. All 6 runs were charged to Wacha, after he had given up just 1 run coming into the World Series, and just 2 runs in Game 2 of the Series. The rookie sensation had finally cracked, costing the Cardinals. In their remaining 5 turns at bat, the Cardinals only had baserunners in 2 of them, and while a Carlos Beltran RBI single in the 7th made the score 6-1, and Allen Craig hit with the bases loaded in that same half-inning, it was the Red Sox night and the outcome of the game was never really in doubt. Jon Lester went 6 2/3, and was relieved by Junichi Tazawa (1/3 inning), Brandon Workman (1 inning) and Koji Uehara (1 inning), who came in to pitch the 9th and retired the side, striking out Matt Carpenter for the final out, becoming the first Asian-born pitcher to record the final out of a World Series clincher. The Red Sox had won the game 6-1, and the series 4-2, taking home another World Series championship. David Ortiz was intentionally walked 3 times over the course of the game, and was unintentionally walked in the 1st, becoming the 7th player to draw 4 walks in a World Series game, and the 4th to be intentionally walked 3 times in a World Series game (Albert Pujols in 2011, Barry Bonds in 2002, Rudy York in 1946). Ortiz was the series MVP, after hitting .688 with a .760 on-base percentage, becoming the 3rd oldest World Series MVP (37 years, 346 days), behind Willie Stargell in 1979 and Randy Johnson in 2001. His .760 OBP was 2nd all-time behind Billy Hatcher (.800 in 1990). He was the 2nd player in World Series history to reach base 3 times in 5 straight games, joining Barry Bonds in 2002 (although Bonds’ Giants didn’t win that Series). Even with Ortiz’s success, the Red Sox hit just .211 for the series, which is the 2nd lowest average by a World Series winner since 1969, behind only the 1972 Orioles, who hit .209. John Lackey became the 7th pitcher in history to win two World Series-clinching games, but the first to do it for 2 different teams, after he won Game 7 for the Angels in 2002 as a rookie. The Cardinals did have 9 hits, meaning Lackey became just the 2nd pitcher to allow 9 hits and 1 run or less in a World Series clincher, joining Spud Chandler in 1943. Red Sox fans could finally celebrate at fabled Fenway Park. A few minutes after the game ended, as I absorbed the history unfolding on my TV, I said to everyone in the room that the curse (referring to the so-called Curse of the Bambino, often cited as a reason for the Red Sox World Series drought from 1918-2004) was now officially, completely over, since a title had now been clinched and celebrated on the field at Fenway Park. This is the 3rd title for David Ortiz, the final holdover from the 2004 team that won the Red Sox first title in 86 years. This was also manager John Farrell’s first title, in his first year with the Red Sox, after spending the previous two years with the Toronto Blue Jays. Boston has the winter to celebrate. As for the rest of us baseball fans, the countdown to spring training (which stands at about 15 weeks) now begins. The NFL season is at about the midpoint, as we are now through 8 of the 17 weeks that make up the regular season. As we look at where all the teams stand now and where they could go in the second half of the season, it serves as a measuring stick for where each team stands and their legitimate goals for the season. Note: In the projected standings, the only ties I broke were for playoff spots; ties that do not affect the postseason, I did not break (in other words, the team listed ahead may not be actually ahead). In the current standings, NFL.com broke the ties for me. Now we advance to the playoffs, using my projected standings as seeding. While the Redskins, Panthers, Bears, Cardinals, Chargers, and Jets missed the playoffs in my projections, I would not be surprised at all to see them playing in the postseason in January. 1. Alabama (8-0). Alabama remains the top-ranked team in each poll, the BCS, and in my ranking. The Tide now have the nation’s top-ranked defense (they’re usually at or near the top here), having allowed more than 10 points just once (although that game was 42 points allowed vs. Texas A&M). They have a week now to take a breather and prepare for what has become possibly the nation’s premier annual matchup between the Tide and LSU. That game is in Tuscaloosa on November 9. 2. Oregon (8-0). At halftime on Saturday, there were doubts if Oregon would stay undefeated against UCLA, as the game was tied. Luckily for Oregon, the game is 60 minutes, not 30, because they blew away the Bruins in the 2nd half, eventually winning 42-14. By the way, the trend I mentioned last week of the Ducks allowing more points each week has ended; they had allowed 38 to Washington State before holding UCLA to 14. Like the Tide, they have a bye week this weekend, but their next game will be worth the wait. The Ducks travel to Stanford for a Thursday night game on November 7 that will likely decide the Pac-12 North and will also have major national championship implications, no matter which team wins. 3. Florida State (7-0). The Seminoles avenged their only conference loss from 2012 in a big way on Saturday, beating NC State 49-17, after a 35-point 1st quarter and a 42-point halftime lead. Ironically enough, although the Seminoles have played 2 ranked teams, their closest game was a 48-34 win against Boston College. Now, they move into a rivalry game against another undefeated team, the Miami Hurricanes, in a game that will be tougher than the 22-point spread given by the oddsmakers to the ‘Noles. This is the biggest Miami-Florida State game 2004. 4. Ohio State (8-0). The Buckeyes are, like the 3 teams above them, undefeated. The difference that holds the Buckeyes down is a weaker schedule in a Big Ten conference that is having a down year, and not blowing out their opponents. However, the tide may have begun to turn, after the Buckeyes won a big divisional showdown against Penn State, 63-14, which was Penn State’s 3rd largest loss ever (and largest since 1900). The Buckeyes need some big wins to catch the top 3, but their schedule won’t allow that to happen. Their next 3 games are against Purdue, Illinois, and Indiana, who have 7 wins between them, before their big rivalry game against Michigan in Ann Arbor on November 30, which will be their toughest test remaining. Looking ahead to a potential Big Ten Championship game, they could face Michigan (again), Michigan State, or Nebraska, should they clinch the division and play in the title game on December 7. 5. Baylor (7-0). Baylor, like Ohio State, is lagging behind the top 3, although that may change over the next 3 weeks. The problem has been a weak schedule, since their toughest opponent so far is Kansas State, but that will change. Each of the next 3 teams the Bears play are in the top 18 in the BCS rankings, beginning with Oklahoma, at home, on November 7. Next, they play Texas Tech at a neutral site, then they will play at Oklahoma State, a team that is very quietly 6-1 on the year. After those 3 games, they will play in-state rivals TCU (on the road) and Texas (at home) to close out a tough final month of the season. If they can survive those games and stay undefeated, they should climb into title contention. 6. Stanford (7-1). Stanford survived a trip to Corvallis, where they beat the Oregon State Beavers 20-12. Stanford’s lone loss was on the road to unranked Utah. They now have a bye week to prepare for their showdown with Oregon on Thursday night, November 7. After Oregon, the Cardinal play in-state rivalry games against USC and Cal, before hosting Notre Dame on November 30 in a game that may be for an at-large BCS bowl berth. 7. Miami (FL) (7-0). The Hurricanes are, somehow, still undefeated, although they’ve had a couple of close calls in games with North Carolina and Wake Forest. In both games, the Hurricanes scored in the final minute to avoid being upset. Also, since last week’s rankings were published, they escaped a bowl ban in the NCAA sanctions for the Nevin Shapiro scandal, although they will lose scholarships. Now, Miami will have to go to Tallahassee, where they will have to play much better than they did against the Deacons and the Tar Heels if they want to upset Florida State. No one is giving the ‘Canes a chance in this game, and they are 22-point underdogs. Then again, they almost lost last week as 23-point favorites, so you never know. 8. Clemson (7-1). Clemson struggled against Maryland on Saturday, eventually winning 40-27, in their first game since their blowout loss to Florida State. While Clemson has dominated most of their opponents, their marquee win remains an opening night victory against a Georgia team that was ranked 5th at the time, but has since lost to Missouri and Vanderbilt as they battled injuries. While most admit the Georgia team that Clemson beat is much better than the injury-riddled one that lost to Vanderbilt, the question still remains about how big that win really should be when considering the Tigers season. They will have a couple of chances for a marquee win the rest of the way. After a trip to Virginia which shouldn’t be much of a problem, they will host Georgia Tech in a Thursday night game on November 14. While the opponent may not necessarily be marquee, the stage will be, as the Tigers can show themselves off to the nation. The other game they can showcase themselves in will be November 30 against South Carolina. That should be a big game for both teams, who should still be hoping for a BCS at-large berth (although the Gamecocks may have a conference title opportunity as well). 9. Oklahoma (7-1). Oklahoma is an odd team to look at over the course of the season. While their only blowout wins are against Louisiana-Monroe and Tulsa, they just keep winning. Other than the loss to Texas, they’ve found a way to win, even when they have been in some games that were probably closer than they should have been, given their opponent. But, as the cliché says, you play to win the game, and with one exception, the Sooners have done that. This past week, they defeated a top-10 opponent in Texas Tech, easily their biggest win of the season, as it handed the Red Raiders their first loss, resulting in their first appearance in this ranking. After a bye this week, they will get an even bigger stage on Thursday night, November 7, in a game at Baylor, when they will likely go in as underdogs against the undefeated Bears. A win there would put them in the Big 12 drivers seat, with a little help from Texas’ opponents, with 3 games remaining. 10. Auburn (7-1). A year ago, I never would have dreamed Auburn would crack my top-10 list at 7-1 under first-year head coach Gus Malzahn. Keep in mind that last year, this program won just 3 games (against Louisiana-Monroe, New Mexico State, and Alabama A&M), and none in the SEC. They have acquired 2 wins against ranked opponents, at home against Ole MIss and at Texas A&M, with their lone loss coming in a 14-point game at LSU. Their next 3 games are at Arkansas, at Tennessee, and at home against Georgia. If they can win these 3 games, they would have a bye week to prepare for top-ranked Alabama on November 30 in the Iron Bowl, at home, with the SEC West title on the line. Also Considered: Missouri (7-1), South Carolina (6-2), Texas A&M (6-2), LSU (7-2), Fresno State (7-0), Northern Illinois (7-0), Texas Tech (7-1), UCF (6-1), Louisville (7-1). Note: If there weren’t still 8 undefeated teams, with 6 from BCS conferences, there might be room for some of these very good 2-loss teams, like South Carolina, Texas A&M, LSU, etc., in the top-10. South Carolina, for instance, showed they have top-10 talent and resiliency with their amazing 17-point 4th quarter comeback to beat Missouri in 2OT. Jeff Gordon won today’s Goody’s Headache Relief Shot 500 at Martinsville Speedway, for his 88th career NASCAR Sprint Cup Series victory, and his first this year. This was his 8th career win at Martinsville. The win was a much needed one for Gordon, as it moved him from 5th to 3rd in the Chase for the Sprint Cup standings, and he reduced his deficit from 34 to 27 points. The win was the 21st at the Virginia short track for owner Rick Hendrick, although the track is also the site of the Hendrick plane crash tragedy in 2004, in which 10 were killed, including Rick’s son and brother, as well as legendary Hendrick engine builder Randy Dorton. 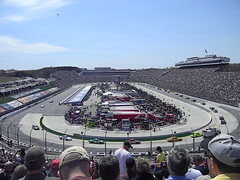 Matt Kenseth, who began the day 4 points behind leader Jimmie Johnson in the standings, led the most laps and finished 2nd, while Johnson finished 5th, resulting in a tie in the standings with 3 races remaining. Kenseth does own the tiebreaker (for now at least) with 7 wins compared to 5 for Johnson. The remaining races are at Texas Motor Speedway next Sunday, followed by Phoenix International Speedway on November 10 and Homestead-Miami Speedway on November 17. Gordon’s win clinched the manufacturer’s championship for Chevrolet (pretty remarkable considering there’s still three races left). This gives Chevy their 11th straight title, and their 37th overall. This will be their 25th title in the last 31 years, with the last 30 of those being the Hendrick era, something that is not a coincidence. While the Hendrick team isn’t solely responsible for this unbelievable run (Richard Childress Racing, Earnhardt Ganassi Racing, Stewart-Haas Racing, Morgan-McClure Motorsports, Darrell Waltrip Racing, Junior Johnson & Associates, Leo Jackson Motorsports, Ranier-Lundy Racing, Hagan Racing, and (briefly) Joe Gibbs Racing have also played a part in Chevy’s success over that time span), they are a major reason Chevrolet has dominated the sport. Hendrick Motorsports has won 10 championships and 217 races in 30 Sprint Cup seasons, with drivers like Jeff Gordon, Jimmie Johnson, Terry Labonte, Ken Schrader, Darrell Waltrip, Dale Earnhardt Jr., Kasey Kahne, Mark Martin, and Geoff Bodine. Of those championships, Johnson has 5, Gordon has 4, and Labonte has 1 (Waltrip and Bodine won their titles with other car owners). Hendrick also has 7 Daytona 500 wins. In Saturday’s Camping World Truck Series race, an event that would normally be an unnotable preliminary became a historic occasion when Darrell Wallace Jr. took the checkered flag, becoming just the second African-American to win a race in a NASCAR national series (the national series are the Sprint Cup, Nationwide, and Camping World Truck circuits). The first man to do it was Wendell Scott, on December 1, 1963 at the now defunct Jacksonville (FL) Speedway Park. Scott died in 1990, but his sons Franklin and Wendell Jr. made an appearance at Martinsville this morning alongside Wallace. The 20-year-old Alabama native, who is called “Bubba” by many in the garage area, was making just his 19th career start in the Truck Series, acquiring his 5th top-5 and his 11th top-10 finish. He currently sits 8th in this year’s points standings in the series, and could realistically finish as high as 5th in the standings at year’s end (he’s not mathematically eliminated from the title, but it’s unrealistic that he could catch points leader Matt Crafton). 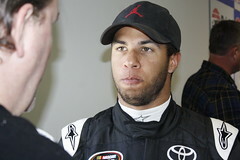 Wallace had previously become the first African-American winner in the K&N Pro Series East in 2010 at Greenville-Pickens Speedway in South Carolina, and he won Rookie of the Year in that series that season. Also, in 4 Nationwide Series starts in 2012, he has compiled 3 top-10 finishes with a high of 7th. Everyone who watched the race yesterday, and everyone who has followed Wallace’s career can tell you he has an exceptional amount of talent, and that the win which was his first won’t be his last. If he reaches the Sprint Cup Series (and I firmly believe he will), he will be the first black driver to start a Sprint Cup Series race since Bill Lester ran 2 races for owner Bill Davis in 2006. Before that, the most recent man to do it had been Willy T. Ribbs in 1986. Watch out for Wallace, who currently drives for Kyle Busch Motorsports, to make some noise, and some more history, in the future. We learned last week that this weekly post of mine, or others like it, are just simple predictions that can be wrong in a heartbeat. But, in the spirit of the game, and in preparation for another big week of college football, those like me who think they can predict the future continue. That being said, here are my picks for Week 9. Game of the Week: #10 Texas Tech (7-0) at #15 Oklahoma (6-1). 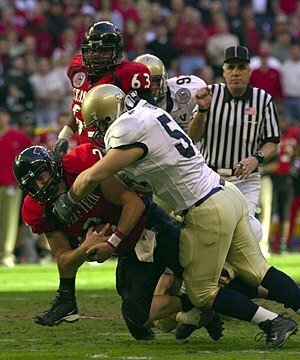 Texas Tech come into this game as a touchdown underdog, even though they are one of 10 remaining undefeated teams. Oklahoma’s loss came to Texas in the Red River Rivalry, and they’ve had a couple of other upset scares as well. The only games remotely close for Texas Tech were against TCU (which was an upset at the time), and the last 2 games against Iowa State and West Virginia, but they haven’t really been threatened. That may change against the Sooners. The last time Texas Tech was undefeated this late in the season, they lost to Oklahoma in 2008. Then again, the last time the Red Raiders visited Norman, they left with an upset victory over the then 3rd-ranked Sooners. Oklahoma won last year’s meeting, 41-20, but Texas Tech has changed dramatically since then. Oklahoma’s biggest problem is offensive consistency, but I think when the bright lights are on, they will be able to put some points on the board. The key matchup will be Texas Tech’s 2nd-ranked passing offense against Oklahoma’s top-ranked passing defense. I expect a high-scoring game, and I give the edge to the home team, in a close game late. Oklahoma 48, Texas Tech 45. Big Game Guarantee: #21 South Carolina (5-2) at #5 Missouri (7-0). Missouri is a 3-point home favorite, which is usually the odds-makers way of saying the teams are even (and giving the home team a very slight edge). The main difference in the two teams is that Missouri has outscored the Gamecocks by almost 12 points per game, while the defenses are almost even and the Tigers have outgained the Gamecocks by only a slight margin in both the rushing and passing categories. One stat the Missouri defense does have an advantage in is sacks, with 23, which leads the SEC. That may very well come into play against South Carolina’s offensive line, which has struggled at times, and backup QB Dylan Thompson, who will play due to Connor Shaw’s knee injury. That’s a big blow, as Shaw had perhaps the best game of his career last year against Missouri in a 31-10 win. Then again, this is a much better Missouri team. A backup QB will also be playing for Missouri, with Maty Mauk making his second career start due to James Franklin’s shoulder injury. He led the Tigers last week on 8 scoring drives (even though 5 of those resulted in just a field goal) in his first career start. The last two times Missouri was undefeated this late in the year, they lost two in a row coming off big wins the week before. If that happens, I don’t believe it will be this week. If Missouri can win, they will almost guarantee, barring an unforeseen upset, the SEC East division title. Missouri 31, South Carolina 21. Another Big Game Guarantee: Penn State (4-2) at #4 Ohio State (7-0). The Buckeyes come into this conference matchup with the Nittany Lions undefeated, but feeling underappreciated by the media. They probably have the most to prove out of the major national title contenders, if they want to play in Pasadena on January 6, as the result of a down year in the Big Ten and some close calls that threatened their unbeaten record. Yet, Urban Meyer still hasn’t lost a game at Ohio State as head coach (19-0). This week, they play a pretty big game against Penn State, who upset Michigan two weeks ago, and had a bye last week, giving them an extra week to prepare for a trip to The Horseshoe. Penn State’s losses are to UCF and Indiana. While the UCF loss doesn’t look as bad as the season continues, the Indiana loss, which was by 20 points, is certainly a head-scratcher. Freshman QB Christian Hackenberg has played superbly for the Lions, particularly in the win over Michigan in 4OT. Penn State has only won 2 of the last 5 meetings in this series, but both of those wins were in Columbus, including their first win after the firing of Joe Paterno in November 2011. The winner of this game will be in the driver’s seat in Big Ten Leaders divisional race. In the end, although Penn State has a good team, and I like what Bill O’Brien is doing there, I think with all that Ohio State needs to prove, and with the media saying they need to start demolishing opponents to have a shot at the title, they will shine on a national stage in a primetime game on network TV. Ohio State 34, Penn State 24. Upset of the Week: #6 Stanford (6-1) at #25 Oregon State (6-1). Stanford has won 3 straight in this series, and they are 4-point road favorites. Neither team is undefeated, although both probably feel they should be. Stanford lost 2 weeks ago to unranked Utah, 27-21, in a game in which they had a good chance to score in the final seconds, but failed to do so. Oregon State’s loss was in a very odd, high-scoring game on the season’s opening weekend against FCS powerhouse Eastern Washington. Since then, they’ve reeled off 6 straight wins, including an overtime victory against that Utah team that beat Stanford. After their loss, Stanford won a top-15 showdown against UCLA last week, 24-10, moving themselves back into the top 10 in the polls, and ranking 6th in the BCS. I believe this will be a good game regardless, and I believe the Beavers win for a couple of reasons. Stanford struggled against Utah, which has an average offense and an average passing attack. Oregon State, however, has the 9th most points per game in the nation, and the nation’s top-ranked passing offense, led by Sean Mannion, who leads the nation in TD passes, and is threatening to break into the Heisman conversation. Secondly, Stanford won a big, in-state rivalry game against a top-10 team last week when they beat UCLA, and their next game after the Beavers will be a Thursday night showdown with Oregon on November 7. This schedule allows the Oregon State game to look light, compared to the Bruins and the Ducks, even though the Beavers are in the top 25 in the BCS (although they’re just short of being ranked in the polls). Oregon State also has the crowd working in their favor, which is often a factor in upset bids. Oregon State 45, Stanford 38. Closer Than The Experts Think: #12 UCLA (5-1) at #3 Oregon (7-0). This was an easy pick for this category because Oregon is favored by 23 points against a pretty good and hungry UCLA team. For perspective, that’s the same spread as the Miami-Wake Forest matchup. While Oregon is 3rd in the BCS and 2nd in both polls, UCLA won’t roll over too easy, coming off a 24-10 loss to Stanford last week. These two teams haven’t played since the 2011 Pac-12 Championship Game, which Oregon won 49-31. UCLA has improved vastly since then, however, with the addition of coach Jim Mora Jr., and the emergence of QB Brett Hundley. ESPN showed a graphic this afternoon showing how even these two teams are offensively, in terms of plays run per game, how many seconds they average in between plays, etc. The only stat that jumped out as a real advantage for Oregon was turnover margin, as the Ducks are at +13 and the Bruins are at +3. One stat I’ve discovered, however, points out a bigger difference in the two teams, and it’s a very simple stat: points per game. Oregon averages 57.6, while the Bruins average just 39.8. Both sides have good defenses, so I don’t think there will be quite that much scoring, but these offenses will certainly have their highlights. I don’t see UCLA threatening Oregon, but I do think they beat the spread. Oregon 42, UCLA 24. The 109th World Series begins tonight between the National League champions, the St. Louis Cardinals, and the American League champions, the Boston Red Sox. Both of these franchises have a strong tradition as well as a rich recent history, as the Cardinals will be playing their 4th World Series out of the last 10, and the Red Sox will be playing their 3rd out of the last 10. The Cardinals won it all in 2006 and 2011, with their lone Series loss in this stretch coming to the Red Sox in 2004, with the Sox also winning the Series in 2007. These two teams have met in three previous Fall Classics, with the Cardinals winning in 7 games in both 1946 and 1967, and the Red Sox sweeping the Cards in 2004. Let’s have a look at some of the matchups in the 2013 Fall Classic. Lineup: Red Sox (barely). The Cardinals will have some help from the returning Allen Craig, who will be able to play DH in the games in Boston. It is unsure, however, how well Craig will hit, since he last played on September 4. He joins clutch hitters Carlos Beltran and Matt Holliday in a very solid Cardinals lineup. But the Red Sox have a tendency to force opposing pitchers to throw more pitches, wearing them down over time, and eventually get the big, timely hits to beat them. Expect Shane Victorino, Mike Napoli, and Dustin Pedroia to shine, and we know David Ortiz will be strong for the Sox. Bench: Cardinals. With Daniel Descalso and Pete Kozma platooned at shortstop, one will always be on the bench. In addition, Shane Robinson and Adron Chambers have contributed throughout the playoffs. The Red Sox bench, which I had doubts about at the beginning of the playoffs, have also proven their worth, with contributions by Jonny Gomes, Matt Carp, Quentin Berry, David Ross, and the platoon combination of Xander Bogaerts and Will Middlebrooks at third base. Rotation: Cardinals. This was a tough call, as the names in the Red Sox rotation are more recognizable and the players are much more experienced. Jon Lester will start Game 1, and will be backed up by John Lackey, Clay Buchholz, and Jake Peavy. But what the Cardinals lack in experience, they make up for in stuff and nerves of steel, with Lance Lynn, in just his second full season, and rookies Joe Kelly and Michael Wacha, who won the NLCS MVP award after being extremely stellar. And of course, Cardinals ace Adam Wainwright is always brilliant, and hasn’t allowed a run in 3 innings of previous World Series action (he was the closer for the 2006 Cardinals). Bullpen: Cardinals. This is another tough decision (kind of a theme in this series). I had seen the Red Sox bullpen as a weakness going into the playoffs, but they have been very solid, with Craig Breslow, Junichi Tazawa, and Franklin Morales shining so far in the postseason. The Cardinals’ bullpen ERA during the regular season was 0.36 better than the Red Sox, and like the rotation, they simply have a bunch of good, strong arms, including Edward Mujica, Seth Maness, and John Axford, in addition to the 38-year-old veteran of the staff, Randy Choate, whose last World Series appearance was with the 2001 Yankees. Manager: Red Sox. Cardinals manager Mike Matheny would have the edge in this category against most opponents, as all he’s done in his two years is get within a win of the World Series last year, and reaching it this year, after taking over for future Hall-of-Famer Tony La Russa, who retired after the Cardinals 2011 title. John Farrell, however, took over the Red Sox last winter after they had gone 69-93 under Bobby Valentine. Following some offseason roster changes, and the inspiration the team led in Boston after the Marathon bombings on April 15, the team proved they were the best in the east, going worst to first, and beating the Rays in the ALDS and the Tigers in the ALCS. Even before the playoffs, Farrell showed why he should be AL Manager of the Year, and has now solidified that award that he is likely to win. Home-field/crowd: Red Sox. This is a tough one, as these two teams have equally proud and intense fan-bases who know their baseball and have had a lot to cheer about over the last decade. In the end, the Red Sox would have 4 games at home, if the series goes the distance, and the Cardinals would only have 3. Therefore, give the slight edge to the Red Sox because of the incredible atmosphere created during playoff games at Fenway Park. In all seven of these criteria, it was very difficult to choose one team with a better unit or individual, and the Red Sox ended up with a slight edge in 4 of the 7 criteria. Therefore I think they will win the series in 7 games, 4-3. If this happens, it would be the first time the Red Sox win in a World Series Game 7, as they are currently 0-5. That being said, since Game 7 in 1986, the Red Sox have not lost a World Series game, sweeping in both 2004 and 2007. Regardless, this should be an excellent series, and I wouldn’t be surprised to see the Cardinals win the series, even though I’m picking against them. The only thing that would surprise me is if the series was a sweep, either way, or even if it ends in 5 games, because both teams are too good for that. This is, after all, the first World Series since 1979 to include the teams with the best records and the best run differential from both leagues. One final note is that tonight’s Game 1 will be pivotal, according to this trend: the winner of Game 1 has won 21 of the last 25 World Series. After the weekend’s college football action, a huge shakeup occurred in my rankings, given the fact that number 3, 6, 7, 8, and 9 in last week’s rankings all lost, and number 10 was a few fingertips away from losing. Let’s look at the new rankings. 1. Alabama (7-0). The Tide rolled over Arkansas, 52-0, in what seemed to be the only “normal” SEC game on Saturday. After the shutout, the Tide now lead the nation in defense. This week the Tide will play Tennessee, a team they should beat easily although the Vols did just upset South Carolina, before a bye week and a date with LSU. A matchup at Auburn on November 30 is probably the biggest test left for the Tide, after Auburn showed their strength upsetting Texas A&M, the only team so far to threaten the Tide. The SEC West will probably not be decided until that day. 2. Oregon (7-0). Oregon had previously been very close to being ranked 1st in this ranking, as for a while they were statistically better than Alabama. While the Oregon offense continues to impress, their defense has yet to statistically improve from one week to the next, allowing 3, 10, 14, 16, 16, 24, and 38 in their games. While the competition has been tougher as of late, that last game where they gave up 38 was against a Washington State team that is about average. The Ducks two biggest games are their next two games, first hosting UCLA this Saturday, before a bye and a trip to Stanford on a nationally televised Thursday night game that will be quite a showdown. 3. Florida State (6-0). The Seminoles left no doubt who the best team in the ACC is on Saturday night, winning their much-hyped game with Clemson 51-14. Freshman QB Jameis Winston shined on a national stage, and may now be the leading contender for the Heisman (but there’s a lot of football left). Not only did the offense shine in the blowout, but also the defense, who held Clemson to 7 points for the first 59 and a half minutes, before Clemson’s second-string offense scored in the closing seconds on FSU’s second-string defense. In the inaugural BCS rankings, the Seminoles are 2nd, helped by a strong computer ranking and their 3rd place standing in both major polls. Now the Seminoles have a potential revenge game at home against NC State, the team that spoiled their title chances a year ago, with a big game with fellow undefeated Miami, the ‘Noles biggest rival, lurking on November 2. I have FSU at 3rd, but they could easily have been 2nd and are even threatening for 1st. 4. Ohio State (7-0). Ohio State has the nation’s longest winning streak, 19 games, and Urban Meyer hasn’t lost as coach of the Buckeyes. So why are the Buckeyes struggling to keep up with the top 3? The Big Ten is down, and the Buckeyes haven’t played too tough of a schedule. Their best win had been a come-from-behind win at Northwestern, but that win has lost its status because Northwestern hasn’t won since that game on October 5. Now their biggest win is against Wisconsin, a 31-24 win on Sept. 28 in Columbus, but while Wisconsin is ranked in the 20s in both major polls, they are unranked in the BCS. The Buckeyes need a statement game, but their schedule doesn’t provide one. They host Penn State on Saturday, and they play at Michigan on November 30 in their toughest two games remaining. They will need some help from the opponents of the top 3 teams if they want to play for a national championship. 5. Missouri (7-0). The Tigers make their first appearance in this ranking this year, and it comes after a remarkable start to the season and a remarkable turnaround. Last year, in Missouri’s first season as a member of the SEC, they went 5-7 and failed to reach a bowl game. After 5 games this year, they were undefeated, but their best win was over Vanderbilt. That changed when the Tigers traveled to Georgia on October 12 and beat the Bulldogs 41-26. Gary Pinkel’s squad now had the attention of everyone in the SEC, and most everyone around the country. Some thought that surely they couldn’t keep it up against Florida, particularly with starting QB James Franklin out with an injury, but they beat the Gators 36-17. Now South Carolina comes to Columbia (that means the Gamecocks will travel to Columbia, MO from Columbia, SC) in a game that could, in all likelihood, clinch the SEC East for Missouri (they would still have to win two more games, but their schedule is favorable). This will be one of the bigger games in program history, as the Tigers try to continue their magical season. If Missouri wins on Saturday, circle the date: Texas A&M will be in Columbia on November 30. 6. Baylor (6-0). Baylor has impressed in their early games, winning all 6 and averaging 64.6 points per game, best in the country. Their game against Iowa State was my “Closer Than The Experts Think” pick last week, as I felt Iowa State would make the game closer than the 33-point spread. Instead, Baylor won 71-7, and now they make their first appearance in my rankings. While it can be said that their schedule has been weak, that will change quickly. After what should be an easy win against Kansas this week, and a bye next week, they will play Oklahoma at home and Texas Tech at a neutral site in back-to-back games. These two games will be the Bears’ big test, and will be followed by another test at Oklahoma State. Those 3 teams have just 2 losses between them. 7. Stanford (6-1). The Cardinal responded to their loss to Utah with a convincing 24-10 defeat of in-state rival UCLA, who was ranked in the top 10 of both polls and in this ranking. This week they will play Oregon State, who has cracked the rankings at #25, making them the 3rd ranked opponent in 4 weeks and the 4th in 6 weeks for the Stanford Cardinal. After the game with the Beavers, it won’t get any easier. On November 7, the Cardinal will have a highly anticipated showdown with Oregon, a game that may decide the Pac-12 North division title. David Shaw’s squad has been through a rough schedule, but they will be rewarded after the Oregon game with games they should win against USC, Cal, and Notre Dame. 8. Miami (FL) (6-0). The Hurricanes somehow survived a trip to Chapel Hill last Thursday night and remained unbeaten after Quinshad Davis dropped what would have been the game-winning pass for North Carolina in the end zone on the final play of the game. Miami hasn’t played as tough a schedule as some of the higher-ranked unbeaten teams, and the haven’t been blowing everybody out, but they are winning (and as Herm Edwards once said, “You play to win the game”). This week the Hurricanes will host Wake Forest in what should be an easy win, although if they look ahead too much they might struggle. That’s because their next game after the Deacons visit will be in Tallahassee against Florida State, a game that should have as much hype (if not even more) than last week’s FSU-Clemson game. That would be the biggest game in the classic FSU-Miami series since they met in the 2004 Orange Bowl (before Miami was a member of the ACC). 9. Clemson (6-1). Let’s face it; Clemson didn’t look very good in their game against Florida State on Saturday night. However, that game was against a very good football team, and they were dismantled by a young QB who is already one of the nation’s 3 or 4 best. That, in addition to the fact that all four of teams ranked 6-9 in this ranking lost, kept Clemson in the top 10, both in this ranking and in both polls, as well as the season’s inaugural BCS standings. With what’s left on the schedule, the Tigers could finish 11-1 if they take care of business. This week’s game at Maryland and next week’s game at Virginia could be potential trap games, but I expect the Tigers to come out motivated after being embarrassed by the Seminoles. After that, Clemson hosts Georgia Tech on a Thursday night, followed by The Citadel before their big rivalry game with South Carolina on November 30. 10. Texas Tech (7-0). The Red Raiders make their first appearance in these rankings, as they are off to an impressive start under Kliff Kingsbury, who was Texas Tech’s quarterback from 1999-2002, before becoming the head coach this year after a short pro career as a player and a few jobs as an assistant for Houston and Texas A&M. The Red Raiders biggest win, so far, came back on September 12, when they beat then 24th-ranked TCU 20-10. While they don’t necessarily have any other wins that jump off the page, their offense has been impressive, and they haven’t ever been in too much danger of losing. That might change on Saturday, as Texas Tech visits Oklahoma in a game nationally televised on FOX. After playing the Sooners, they will then play Oklahoma State and Kansas State at home, before playing Baylor at AT&T Stadium in Dallas on November 16, in what could be a huge game if both teams can remain unbeaten until then. Also considered: Auburn (6-1), UCLA (5-1), Texas A&M (5-2), LSU (6-2), Fresno State (6-0), Northern Illinois (7-0), UCF (5-1), Louisville (6-1). Fell From Rankings: LSU (6-2, lost to Ole Miss 27-24), Texas A&M (5-2, lost to Auburn 45-41), Louisville (6-1, lost to UCF 38-35), UCLA (5-1, lost to Stanford 24-10). What were the odds at the end of last season that by the end of the 8th week of this season that Missouri, Baylor, Miami, and Texas Tech would be in the top 10, and Auburn (who was 3-9 last year!) would be just outside the top 10? This is turning in to one of the craziest (and best) college football seasons in quite a while.